I was finally able to complete this set of Mega Man keychains the other day. If we can't get any new Mega Man games, at least we can still get some new merch of them. Released in Japan on February 2015. These little cuties come from one of those Gashapon capsule machines found in some toy stores which made trying to complete a set a challenge. I initially got the original Mega Man from a friend who just got back from his vacation to Japan. 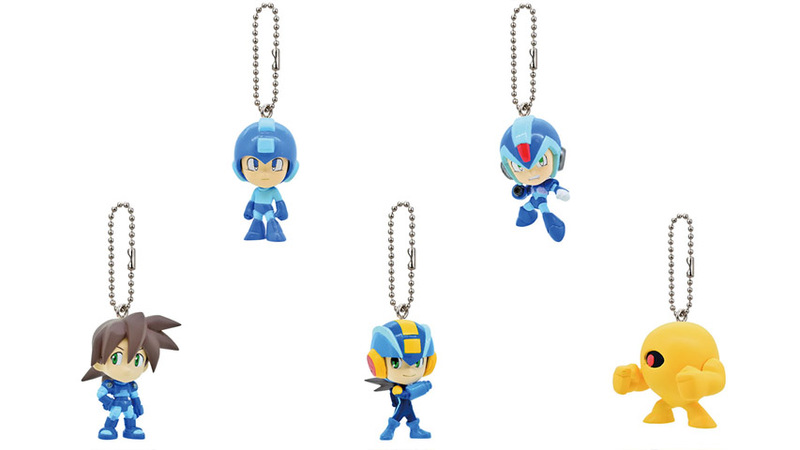 Seeing that they a keychain of each lead Mega Man, I was bummed at the thought of not being able to get a Megaman.EXE figure since he was my favorite of the Mega men. After a random drop by my local Toy Kingdom, I decided to take a look at the gashapon isle since I found out that they had some Gaia Memories on sale. Lo and behold, they had one machine filled with these Mega Man keychains. I had a change to get them all but it was a challenge since they go for a hefty 3 token a pop with each token costing 60php. My hope quickly fell back into despair as that machine ran out after around 2 weeks and at that point I was only able to get X and the Yellow Devil. Good thing the Toys R Us at the next mall also had a Mega Man filled machine handy but was near empty. After 2 duplicate original Mega Mans and 3 spare Yellow Devils, I was finally able to complete the set with the last one I got being the first one I wanted, Megaman.EXE. You could say it was fate. Or I could just have terrible luck. Rockman Keychains from Gashapon World. While we're talking about Mega Man, check out our full LPs of a few Mega Man X games.